We have two Harlequins in this year’s Young Artists’ production of Ariadne auf Naxos—Eric Neuville and Michael Krzankowski. 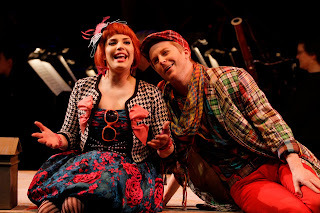 These two young singers get a chance to play the young male leader of Zerbinetta's comedy troupe. Michael is finishing his second year with YAP, after singing Demetrius in A Midsummer Night's Dream, Siegfried in the children's adaptation of Siegfried and the Ring of Fire, and Guglielmo in Così fan tutte. Before coming here, this Chicago native studied at the University of Iowa and Cincinnati's College-Conservatory of Music, but his first inspiration came from the Rodgers and Hammerstein movie-musical Carousel. "No one can play Billy Bigelow better than Gordon MacRae. It's a role I hope to play someday." Eric's first year in YAP is ending with his final role as a baritone -- this summer he makes his tenor debut as Beppe in I Pagliacci at Chautauqua Opera. He studied at St. Olaf College and University of Texas - Austin. This is his first Ariadne, and in fact, his first experience in a Strauss opera. "[Strauss's] harmonic vocabulary is superbly romantic and took several weeks for my ear to latch on to. He's no Mozart!" Take a listen to a snippet of Harlequin's aria, sung by Stephen Genz, as he tries to cheer up the lovelorn Ariadne. Und so musst du mir nicht sein! Today and every other day. Your broken heart beats on in vain. To this grief do not succumb. You must not let your heart go numb. though your path be dark with strife. Must move on, forget, forgive. This is also Michael's first Ariadne, and he's really enjoying the comedy aspect. "There's a camaraderie among the actors playing the troupe, which has easily transferred onto the stage," he said, and he's looking forward to seeing how the audience reacts. "There have been plenty of laughs and tears during rehearsals, even among the cast members." Once Araidne closes, Michael heads to Glimmerglass Opera to cover Almaviva in Il nozze di Figaro. He also recently joined the roster of Hubbard-Levine Management, and is moving to New York City to pursue his opera career. After Eric performs with Chautauqua Opera, he's coming back to YAP in the fall as a tenor to sing Guglielmo in Viva La Mamma and Don Ottavio in Don Giovanni. He'll also make his mainstage debut at Seattle Opera as Normanno in Lucia di Lammermoor and return as the First Priest in The Magic Flute. You can see Michael perform Harlequin on April 9 (he also performed last night), and you can catch Eric on April 3 and April 11. Whichever night you go, you'll see a great comedic Harlequin! Thank you so much for providing this article for public read! I'm really fond of Michael Krzankowski and his amazing work he performs.